I looked at other zombie costumes at the stores but I wasn’t very happy with them and they were really expensive and cheap looking. So I decided to make my own and it was a lot cheaper! I went to a thrift store and found this great dress that was a prom dress, my husband and I ripped it up with a knife and used some fake blood that we bought at the Halloween stores (they open up close to Halloween). I suggest doing this outside so that you don’t get any of it on your floors, also a syringe would be a good idea to do some great detailing on your dress. I then went to the Halloween store and bought some white face paint, I did it on my face, chest, and arms, so I needed a lot. Then I bought a palette of face paint from there that had green, yellow, black and red. I also used some eye makeup that I had at home (you could use whatever you have laying around or buy some cheap ones). I purchased some Vaseline to make my bruises look more real and I also purchased some white-out contact lenses (there are several sites for them and they were about $60 for the pair). I bought some spiderwebs and moss from the Halloween store but you could also look at any craft stores like Michaels and you might find a better deal. I started out a week before Halloween decorating my dress- I used the yellow, black, green, and red palette dirtying my dress. I just used my hands and blended all the makeup so that it looked like I had been rotting. I really tried to go around the frayed areas that we had made. Have fun with it and be creative! When it was Halloween I started getting ready with the makeup. I just applied the white makeup all over my arms, face, chest, ears, back, and hands. Then I outlined the bottom of my cheek bones with some black and blended it in lightly with my fingers to give that sunken in look. I also did it around my neck and tried to create a sunken look effect. After all that I started creating the bruises, I started with some purple and then some blue and yellow and green, and some red, layering and blending really gives it that real look. I then put Vaseline over the fake bruises to give it that shiny look. I put some red around my nose to give that sick look, and put some black makeup on my lips. Around my eyes I did some black first and then red and light purple to give that sunken in look. Then my husband started to draw veins all over with the light blue eye liner pencil. I put my hair back, sprayed it with the hair coloring spray, then I just spread the spider webs all over and the moss. I really wanted to look like I had just climbed out from a grave! I put my contact lenses in and I was ready! I suggest you try the contact lenses before that night if you’ve never worn contact lenses before. Towards the end of the night my eyes were burning from the irritation from the fog machines going and my makeup, so bring some contact lens solution with you and something to put them back in because your eyes may start to dry out. 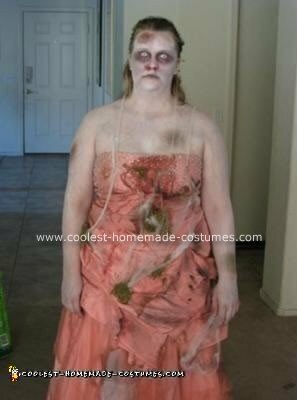 I hope you enjoy my homemade zombie prom costume! You did a very good job on this one. Wow, you did a GREAT job on that costume!!! The fake moss and spiderwebs add a nice touch :) well done! Thank you everyone! It was definitely fun!